The Nile-Akagera River system is considered to be the longest in the world. Early, great kingdoms flourished along its still important banks. Affluent parts of modern Cairo, Egypt along the banks of the Nile. The Nile River is the longest river in the world. It arises south of the Equator and flows north through north-eastern Africa before finally draining into the Mediterranean Sea. Along the way, it covers a distance of around 4,132 miles, and drains an area of about 1,293,000 square miles. Its most distant source is the Akagera, or Kagera River, in Burundi. The Akagera River is the furthest upstream tributary of Lake Victoria, and the most remote headstream of the Nile. It rises from two feeder streams in Burundi near the northern tip of Lake Tanganyika. Carrying a huge volume of water, the Akagera finally drains into the Nile, the former annually emptying around 6.4 billion cubic meters of water into the latter. As per the records of the Ancient Greek historian Herodotus, Egyptian civilization has for millennia been believed to be ‘the gift of the Nile’. Silt deposits along the banks of the Nile rendered the otherwise dry, desert regions of Egypt into fertile lands, which in turn supported the growth of the ancient Egyptian civilization. The people of ancient Egypt grew wheat, flax, papyrus, and other crops along the banks of the Nile, and carried out their trading on the Nile's waterways, leading to the economic stability of the civilization. Water buffalo and camels were introduced into Egypt from Asia and these animals were killed for meat, and were also used for plowing in the fields (in the case of water buffaloes) or for pulling carriages (in the case of camels). The Nile also played an important part in shaping Egyptian cultural and spiritual life. The river was believed to be a causeway from life to death, and from there on into the afterlife. Even the ancient Egyptian calendar was based on the 3-period hydrological cycle of the Nile. Besides Egypt, the Nile-Agakera river system has also supported the human, animal, and plant life along its banks in the other regions wherein it flows, and has done so since ancient times just as it continues to still today. The Nile-Akagera river system supplies water to large tracts of African lands that would otherwise be arid desert lands. This river system is thus responsible for supporting the lives of the millions of people living along its banks today. The Akagera river basin itself supports around 14 million people. The Nile River plays a life-giving role in Egypt, where almost the entire population of the country are based along the banks of the Nile. Khartoum, Aswan, Cairo, and Luxor are some of the world famous cities located along the river. Besides supporting agriculture, the waters of the Nile River system also allow for the transport of goods and people along its length, helping the people to avoid the otherwise isolated tracts of deserts as the only alternative routes by which to reach their destinations. Other countries of Africa, such as Rwanda, Burundi, Sudan, Uganda,and Tanzania, also benefit from the Nile-Akagera river system in terms of their own people's dependence on agriculture, transport, and fishing activities associated with the waters of the river. In areas of the Nile and Akagera rivers where human settlements are not present, the Nile-Akagera ecosystem has developed its own unique sets of flora and fauna. Tropical rainforests grow along the Nile-Congo divide, southwestern Ethiopia, and the Lake Plateau. Ebony, banana, bamboo, and coffee shrub plants grow in these forests. On the plains of Sudan, open grassland and bushland dominates the landscape, and the vegetation there includes such plant species as papyrus, reed mace, water hyacinths, and others. Further north, the vegetation gradually starts thinning, and from Khartoum northwards yields to true desert lands, with their inherently scanty rainfall. The vegetation near the banks of the Nile in Egypt is nearly completely a result of human cultivation and irrigation practices. A large variety of aquatic life thrives throughout the Nile-Akagera ecosystem, including the Nile perch, the barbel, the bolti, the tigerfish, the lungfish, the mudfish, eels, and others. The Nile crocodile is also a famous reptilian species of the Nile-Akagera ecosystems. Soft-shelled turtles, monitor lizards, and hippopotamuses are also common in the region. Heavy human extraction activities have rendered the Nile and Akagera Rivers susceptible to habitat degradation, and climate change has only worsened matters. Water withdrawal from the Nile for irrigation purposes is so high that at times much of its outflow hardly reaches the sea. Also, heavy evaporation along the 3,000-kilometer-long course of the river leads to losses of large volumes of water, making the water supply of the river extremely sensitive to climatic changes. Scientists provide diverging pictures of the future water flow in this long river system, predicting a 30% increase followed by a subsequent, and likely catastrophic, 78% decrease in the water level of the Nile due to the effects of global warming. The lands along the Nile will also become drier and warmer, necessitating the need for even more water-intensive agricultural practices, a cycle further straining the fresh water of the river, and causing adverse changes in the Nile River ecosystems. Fisheries will suffer tremendously, leading to human economic misery and food insecurity. The low quantities of water availability will also probably cause tensions and conflicts among the nations along its length, as they compete to capture the remainder of its dwindling water resources. 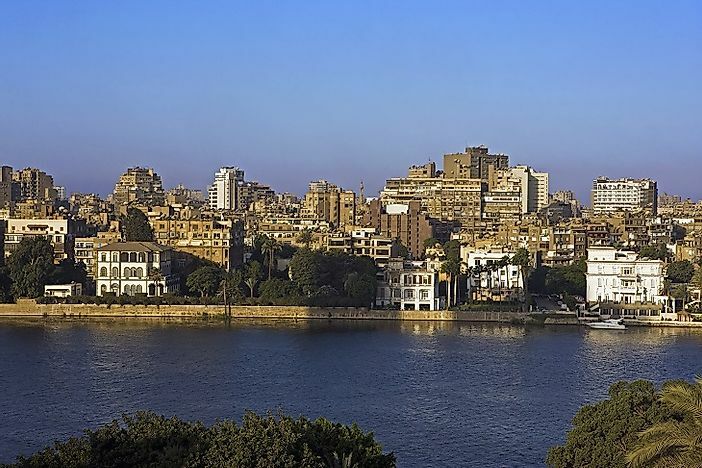 Egypt is already facing drinking water problems due to heavy pollution of the Nile, coming from industrial and residential run-offs and the fertilizer and pesticide leaching from agricultural lands.